Coral honeysuckle is a twining woody vine, usually climbing on other vegetation but sometimes trailing along the ground; older stems have papery brown exfoliating bark. Leaves are opposite and simple, but highly variable within a single plant; early season leaves are linear and strap-like whereas later-developing leaves are oblong to elliptic or obovate, 3—8 cm long, with acute to rounded apices, cuneate to rounded bases, and entire margins, usually glabrous on both surfaces but sometimes minutely hairy below, green above, and glaucous-white below; petiole length varies by position on the stem—leaves of lower nodes may have petioles up to 1 cm long whereas leaves of upper nodes can be sessile, and often confluent/perfoliate directly below the flowers; often some leaves persist all winter long, but the degree of winter leaf retention varies by latitude and severity of winter. 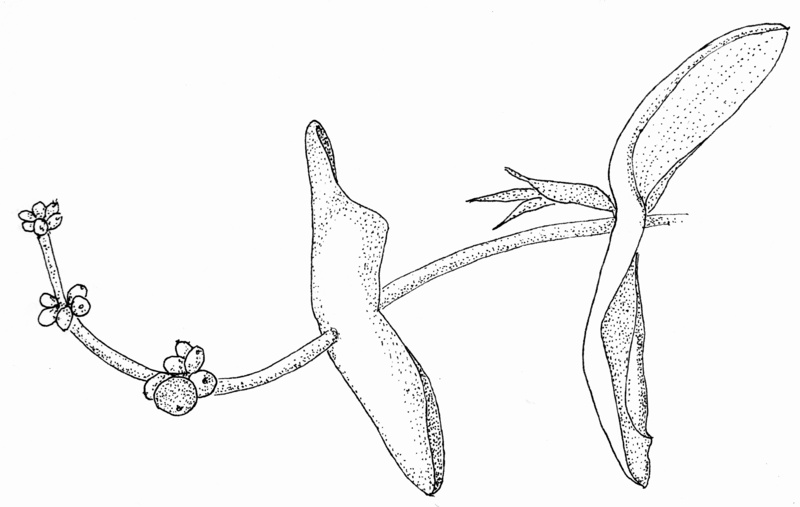 The inflorescence consists of 1—4 whorls of sessile flowers borne at stem tips; flowers are produced profusely from early to mid-spring, sporadically thereafter. Minute bracts and calyx lobes are found at the base of each flower; corollas are tubular, 2—5 cm long, with five nearly equal-sized lobes, red externally and frequently yellow internally (but sometimes all red, orange, or yellow); five yellow anthers are borne near the corolla throat (either slightly included or partially exserted); the globose stigma projects slightly beyond the anthers. The inferior ovary matures as a red or orange berry about 5mm in diameter. The genus Lonicera commemorates, in Latinized form, Adam Lonitzer, a 16th C German herbalist; “sempervirens” means evergreen. There are about 180 species of Lonicera (honeysuckles) found mostly in temperate regions of the northern hemisphere. Nine species of Lonicera can be found growing wild in Virginia; only three of these, including the coral honeysuckle, are native while the other six are exotic escapes from cultivation, including the notoriously invasive Japanese honeysuckle (L. japonica) and Amur honeysuckle (L. maackii). 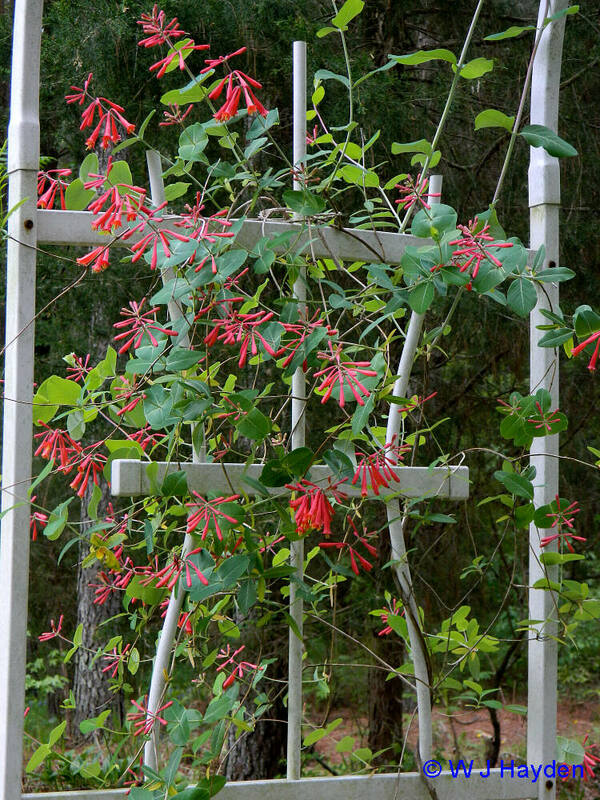 Coral honeysuckle is easily distinguished from other honeysuckles in Virginia by the combination of climbing habit, glaucous evergreen leaves, terminal flower clusters, and red tubular corollas with nearly equal-sized lobes. The genus Lonicera is classified in Caprifoliaceae along with some other familiar shrubs such as Diervilla (bush honeysuckle) and Symphoricarpos (coralberry). Native American traditions include several uses for coral honeysuckle (mentioned here for historical rather than prescriptive purposes). Leaves, either dried and smoked or steeped in warm water as a tea, were used to treat asthma, sore throats, and coughs. Chewed leaves applied to bee stings alleviate swelling. Berries will induce nausea and/or vomiting in humans. Lonicera sempervirens inhabits a wide variety of forests and successional habitats. 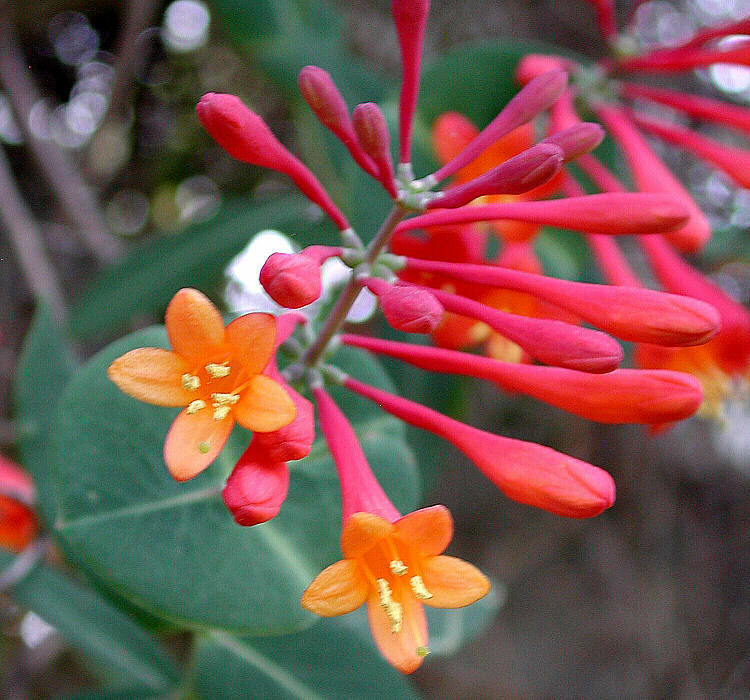 Coral honeysuckle is widely known for its ability to attract butterflies and hummingbirds. In fact, the combination of its bright red tubular flowers with abundant nectar and little floral odor typifies the usual pattern for hummingbird-pollinated species. The bright red fruits are also attractive to birds; consumption by Quail, Purple Finches, Goldfinches, Hermit Thrushes, and American Robins has been documented. Further, the plant is larval host to Spring Azure butterflies and Snowberry clearwing moths. 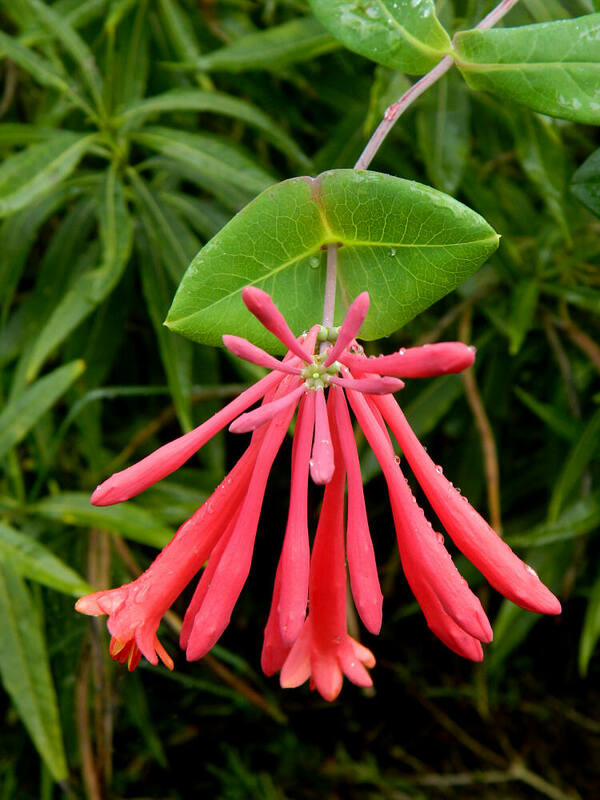 Coral honeysuckle is an excellent garden plant. It prefers well-drained acid or near neutral soil. Full sun with supporting structure such as a fence or trellis will yield the best floral display; the plant can grow in shade, but fewer flowers will be seen. It tolerates clay, deer, and proximity to walnuts. If needed, pruning should follow the main flush of spring flowers, minimizing the risk of removing budded yet-to-flower stems. It is easily propagated by softwood cuttings taken in late spring or summer. To propagate by seed, fruit pulp should be removed, followed by three months of cold stratification. Several named cultivars exist, including cv ‘John Clayton,’ a yellow-flowered form honoring the colonial era botanist and author of the first manuscript flora of Virginia; these plants were discovered on the grounds of the Abingdon Episcopal Church in Gloucester Co., VA. In Virginia, coral honeysuckle is most frequently encountered in the Coastal Plain and Piedmont, less frequently in the Mountains. Lonicera sempervirens is native from Connecticut and New York to Florida, and west to eastern Texas and Oklahoma. It has spread, apparently from cultivation, in several states from Michigan to Missouri and Iowa, also in northern New England. The conservation status of Lonicera sempervirens is secure, although individual populations may be threatened by habitat alteration.